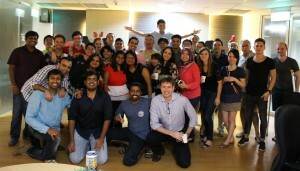 On the last weekend of the year, the NTU MBA batch of 2016 came together for an early Christmas party. Midway through the second trimester and with the upcoming winter break approaching, everyone was excited to not only celebrate the birth of baby Jesus according to Christian tradition, but also a successful first half of the MBA. The Social and Culture Club jointly with the Beer, Wine and Liqueur Appreciation Club had invited for an end-of-year Christmas party and put in a lot of effort to make the event as authentic as possible by setting up a Christmas tree, playing modern arrangements of traditional Christmas songs and ordering an abundance of mouth-watering food, including traditional festive dishes such as stuffed turkey and gingerbread cookies. 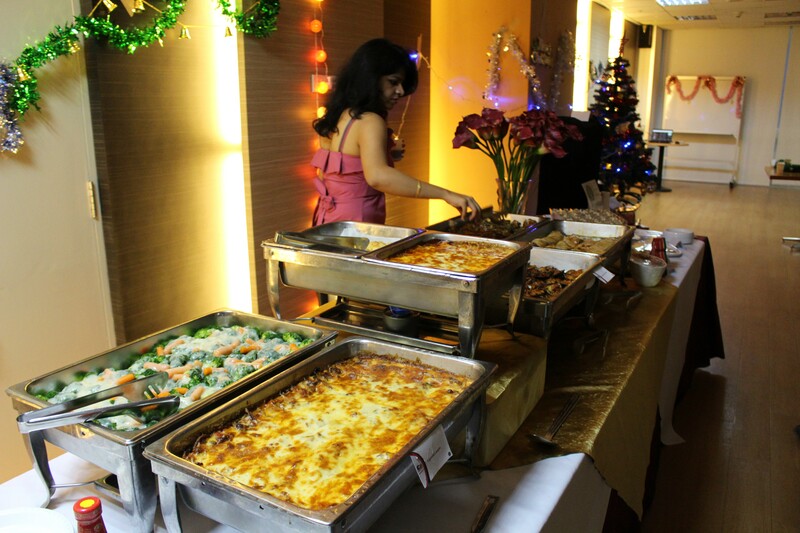 The long queue at the buffet speaks volumes about the exquisite taste of food on the buffet, which was washed down with hot mulled wine and chocolate mousse. „I have never had hot wine before. I don´t know why, because it is so delicious“, said one of the participants who celebrated their first ever Christmas party. Having fed the crowd, Santa fulfilled its duty and distributed the presents that the many „Secret Santas“ had placed under the beautifully decorated Christmas tree. The newly elected Santa Clause, Yuji-San(ta), did an excellent job in helping everyone finding their gifts, and his voice even over drowned out the rustling of wrapping papers as the presentees unwrapped their tokens. 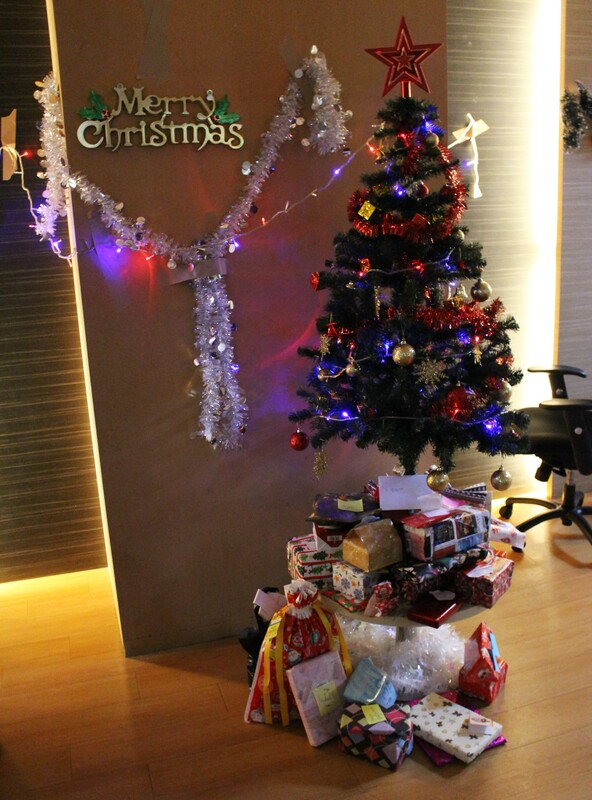 The many voices yelling „Merry Christmas“, asking „Who is my Secret Santa?“ and even more „Thank you´s“ were perfect evidence that giving gifts, as small as they may be, truly spreads happiness. The wave of excitement over identifying everyone´s Secret Santa only came to an end when the organiser crew called for a final activity of the evening: a gingerbread house competition. 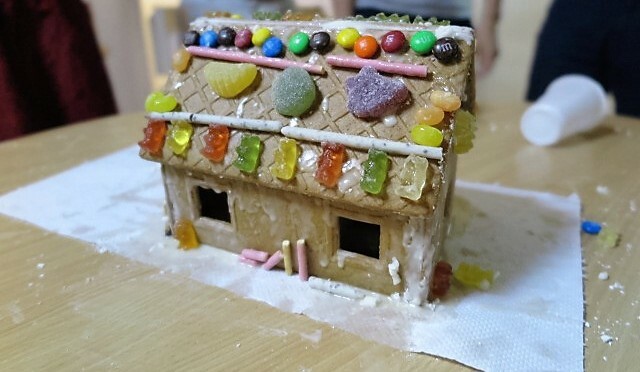 The crowd split up in three groups to build houses of gingerbread cookies, which were judged by its stability and the creativity of its decoration. During the next thirty minutes, the teams were busy mixing sugar paste and stacking cookies in the most efficient way. What a tricky task! The winners clearly stood out of the masses: only one of the three house stood against all shaking test, and even resisted the crash tests carried out by competitors. „This was certainly more difficult than it looked“, the struggling teams claimed while removing remains of powdered sugar from their hands. While the looks of the edible houses differed, all participants left an equally delicate mess of sugar paste, gummi bears and jellybeans. Still, nobody minded cleaning up the sugar-covered event venue, as Christmas really is all about sharing the joy and moving troubles out of sight. Might as well cover them in sugar. 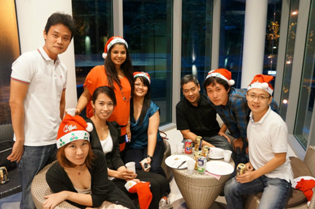 Seeing some photos taken during Christmas season brings back fun memories of my first Christmas in Singapore, celebrated together with my Nanyang MBA peers. The fun and laughter we had that night still resound in my head.